The term ‘CNC cylindrical grinding machines’ refers to machines that are used to shape the outer side of the object. Rise in the use of computing facilities has resulted in rise in the demand for compact CNC grinding machines in the last few years. Computing facilities help in smooth running of these machine. CNC grinding machines also offer finishing and price reduction. This results in increase in the demand for CNC grinding machines. The global competitive environment is forcing the leading companies to adopt efficient manufacturing techniques. In addition, they are also trying to gain a competitive advantage by re-designing their manufacturing facilities for smaller footprints. Smaller footprints help in lowering the manufacturing cost by improving coordination of the production process. With the advent of new technology and continuous growth of the manufacturing sector, the demand for CNC cylindrical grinding machines has risen across the globe. There is a rapid rise in the demand for high-speed and powerful grinding machines. In addition to this, the increasing need for customized production is augmenting the demand for CNC grinding machines. However, the primary factor restraining the CNC cylindrical grinding machine market is high installation cost associated with these machines. The rising usage of advanced technologies has increased the cost of production, which has led to surge in the installation cost over the years. Furthermore, these machines also require expensive tools for their proper operation. Moreover, these machines are expensive to repair. These factors are restraining the global CNC cylindrical grinding machine market. The global CNC cylindrical grinding machine market has been segmented in terms of customization type and application. Based on customization type, the market has been segmented into plunge type CNC cylindrical grinding machine, angular type CNC cylindrical grinding machine, CNC universal grinding machine, and CNC traverse wheelhead cylindrical grinding machine. In terms of volume, the CNC universal grinding machine segment dominates the global market, owing to the rising adoption of these machines in developed countries such as the U.S, Germany, and France. Rise in development of software and increase in computing capabilities have propelled the demand for CNC cylindrical machines in the last few years. Based on application, the market has been segmented into automotive industry, mechanical industry, and others. The automotive segment dominates the market, owing to surging adoption of CNC cylindrical machines in the automotive sector. Manufacturers of automobiles are more focused on delivering efficient products with the latest technology in bulk amounts. This has boosted the demand for CNC cylindrical grinding machines in the last few years. 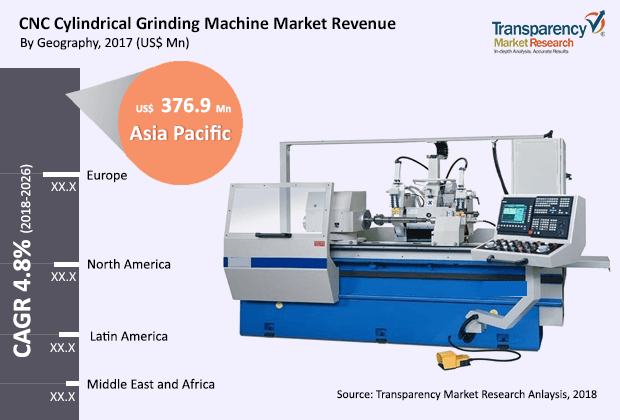 In terms of region, the global CNC cylindrical grinding machine market has been segmented into North America, Europe, Asia Pacific, Middle East & Africa, and South America. Asia Pacific dominates the global market, owing to growth of heavy industries in the region. Some of the key players operating in the global CNC cylindrical grinding machine market are Janinher Machine Co. Ltd., SuperTech Machinery Inc., Hardinge Group, Shanghai Machine Tool Works Ltd. (Ecotech Machinery), Robi Group Srl, Korber Group (United Grinding), L. Kellenberger & Co. Ag, Palmary Machinery Co., Ltd., and Jetkt Corporation. Major players have adopted numerous strategies to sustain in the market. Product development and acquisitions and partnerships are some of these strategies adopted by key players to gain a competitive advantage in the market. The global CNC cylindrical grinding machine market has been segmented based on customization type and application. Based on customization type, the market has been segregated into plunge type CNC cylindrical grinding machine, angular type CNC cylindrical grinding machine, CNC universal cylindrical grinding machine, and CNC traverse wheelhead cylindrical grinding machine.